Well, a cause of death. The victim's death in this Oklahoma case was attributed to "blunt force trauma to the head and asphyxiation," and I'd be willing to bet that blunt-force trauma was the real culprit here but the report does say that asphyxiation was a cause. Said asphyxiation, the report at least strongly implies, resulted from the placement of an elastic waistband around the decedent's neck following what the suspect described as an "atomic wedgie." The incident took place on December 21, but the suspect was arrested just yesterday, after the death was ruled a homicide. It is hard to see why that conclusion took so long, unless there was some reason to believe that the victim pulled his own underwear "up his back and over his head, leaving the waistband around his neck." That certainly qualifies as a "wedgie," which the Oxford English Dictionary defines as "[a]n act of pulling the cloth of a person's underwear, trousers, etc., tightly between the buttocks, esp. as a practical joke; any positioning of a person's underwear, pants, etc., resembling the result of such a pulling." The term first began to appear in English literature in the late 1930s, but its use skyrocketed during the last two decades of the century. I would guess that is due to the influence of certain motion pictures, but I will leave that for cultural historians to decide. 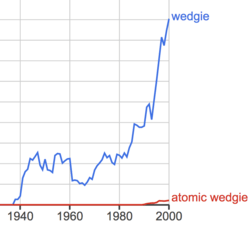 "Atomic wedgie" is a much more recent development. The OED does not have a specific definition for that, but the use of "atomic" probably is meant to imply that the wedgie in question has special destructive power as do atomic bombs. 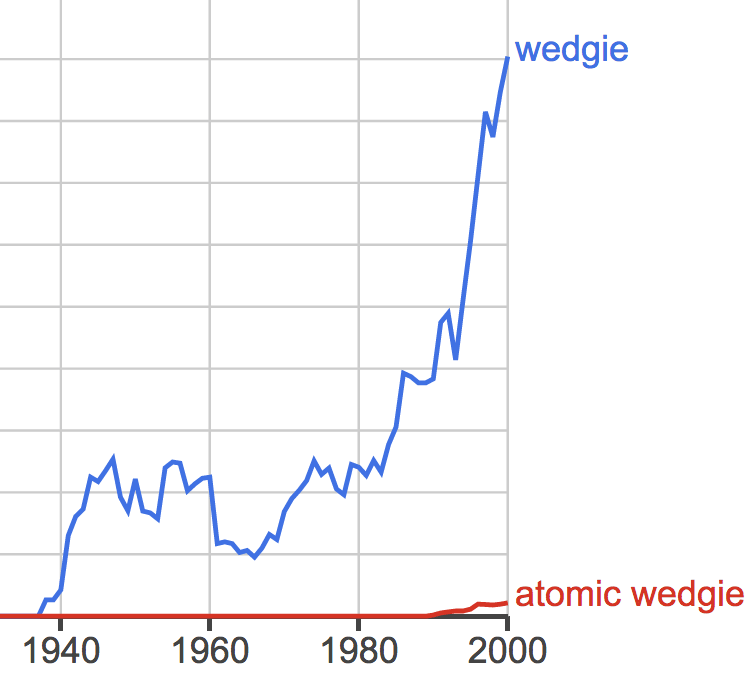 It appears to be generally agreed that an "atomic wedgie" involves, as in the Oklahoma case, the extension of the victim's waistband up and over his head. I suppose it would then be possible to strangle the victim with said waistband, but I still would suspect that death was actually due to the head wound. Exactly how this all transpired is not very clear, but the report says that the victim was at the home of his wife or ex-wife, in violation of a protective order that has been in place since 2008. The man accused of homicide is the wife's son; the victim was his stepfather. So it could be that the suspect was acting in defense of a third party, but he has been charged with homicide. The county sheriff is quoted as saying he had never heard of an "atomic wedgie" before the suspect told them he had given one to the victim. In fact, he "said it was the first time he had ever heard of someone being killed by a pair of underwear." Again, I think the jury will have to decide that.